New Canaan Softball players practice their pitches at Orchard Field in Waveny Park. NEW CANAAN — New Canaan Softball, a local youth organization that boasts around 250 players, is gaining numbers — but with that comes growing pains. Their proposed solution? Getting lights installed by the Water Tower Field in Waveny Park. “Space is the main issue, and the easiest way to help that without intruding on anything else is that the town help us in putting up lights on the fields that are already up,” New Canaan Softball President Robin Biasotti said. According to data from the softball organization, there has been an upward trend in numbers since 2015. Three years ago, there were 94 players and this year there are 257 with a projected estimate of 291 for 2019. “This not only helps us, but addresses growing numbers and gives us flexibility, especially when we get rain in the spring and with our heavy schedule,” Biasotti said. Currently, New Canaan Softball shares Orchard Field with the New Canaan High School softball team. About 100 meters away is the Water Tower Field, a mirror image of Orchard, though without lighting. The organization has both a recreational team and travel team, the latter division a more competitive setting for players that can take them to other cities and states to compete. “When the fall season comes, we’re very limited in terms of space — not to mention that we have practice after homework. 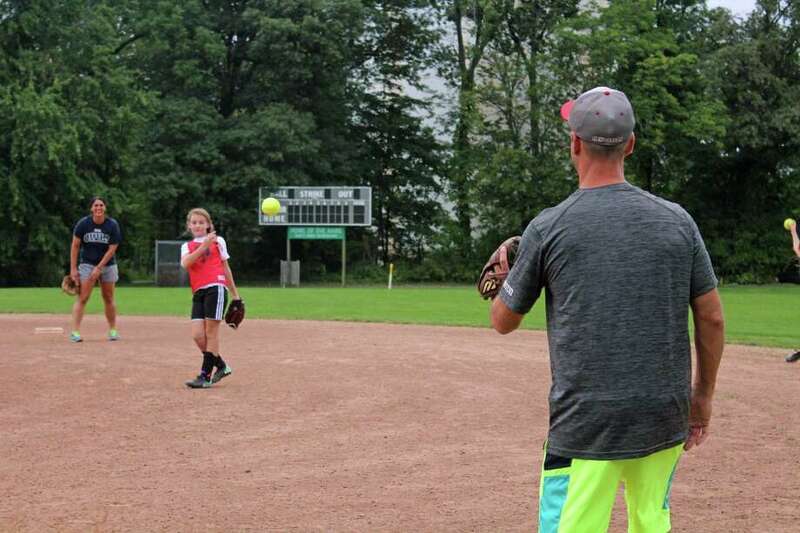 By the time we get here, we only have a few hours of sunlight left, and in fall it gets dark much faster,” Marc Nicolet, whose 11-year-old daughter Lily plays softball, said after a pitching clinic Monday night. The organization recently pitched a plan to the Parks and Recreation Commission during its Sept. 11 meeting, asking for the town’s help in funding lights at the Water Tower Field, a project estimated to cost $125,000. Biasotti, accompanied by Vice President Jessica Connolly and board member Nick DiMuzio, told the town body they had $75,000 from fundraising. Biasotti and DiMuzio attributed the group’s increase in number to rookie programs and word of mouth. “We heard of the team through word of mouth, and something they do really well is making softball fun. And then, if you want to be more competitive, you can join the travel team,” said Jeff Fortmann, whose daughter Riley plays for the softball team. Parks and Recreation Commission Chairman Sally Campbell was favorable toward the plan, but said they would have to look at a private and public partnership or a special appropriation as the upcoming budget season looms. “I think it’s wonderful you have so many girls involved. The more opportunities you have for kids, they better off they are,” Campbell said.